When I first heard about Reading Kingdom, I was instantly intrigued. With so many young learners in my home, reading is always first and foremost in my mind. Reading is a part of every subject we do and key to independent learning (something I am aiming for sooner rather than later). Both my husband and I are avid readers and my eldest son followed right in our footsteps. He loved listening to books, understood reading relatively easily and one day, he just jumped from phonics to fluency and now reads far above his level. I had it all figured out until I started teaching his younger sister. She is a whole other can of worms that one. She is a kinesthetic learner, right-brained, and opposite to anything I know or understand. Teaching her to read has been nothing short of a nightmare and I was very excited to try out Reading Kingdom Online with her with our 1 year subscription! What is Reading Kingdom Online? 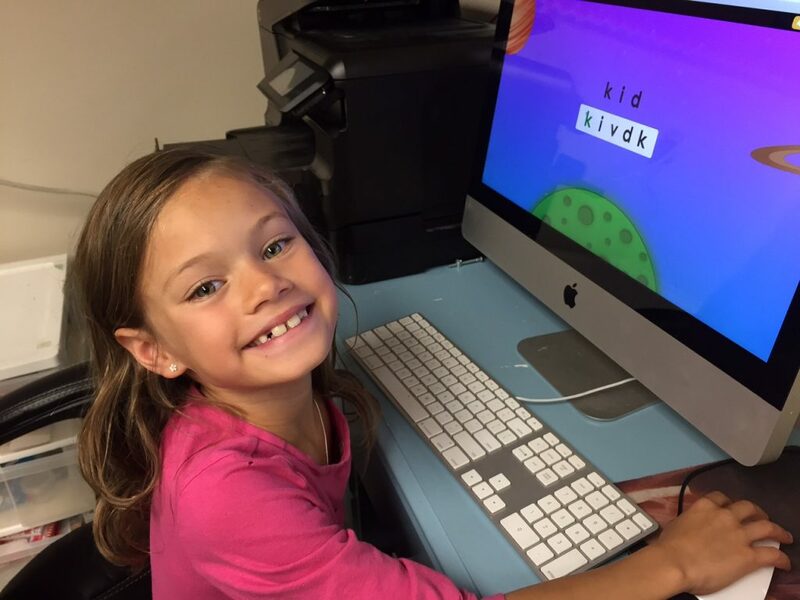 Reading Kingdom Online is the first reading program I have seen that integrates sequencing, writing, phonics, meaning, grammar AND comprehension into the lessons. I have always taught my kids to read phonetically however there are a LOT of confusing rules and anomalies to deal with when you teach only this method. I have long disagreed with teaching ONLY through sight reading as well, believing that it gives children no tools to figure out a word for themselves if they haven’t seen it before. Integrating all of these 6 skills into the lessons, Reading Kingdom sets itself apart as a program worthy of mention and DEFINITELY worth trying in your home! Before you begin with Reading Kingdom, your child takes a Skills Survey. The key to this program being successful is no help from mom and dad! The program customizes itself based on the student’s answers and abilities so if they are receiving help, it is going to give an inaccurate assessment of their skills. Because my dear daughter is a struggling reader, she was placed in the Seeing Sequences section of the program. From the get-go I could see the value of the program. Seeing Sequences helps teach letter recognition, sounds, comprehension, as well as left-to-right reading (important for my sometimes-confused left-handed little girl). It begins with showing a word on the top and asking the child to find the letters (in the same order) below to form the word. It then reads the word to your child and shows them a picture of what it is. As the program progresses, the word disappears after only a few seconds, and the student must remember the sequence of letters. The program advances to Letter Land, teaching keyboarding skills in a fun game and then onward to the formal reading training of the program. There are 5 levels of readers and each level has 6 books for your child to complete as well as an assessment before they move on to the next level of reading. 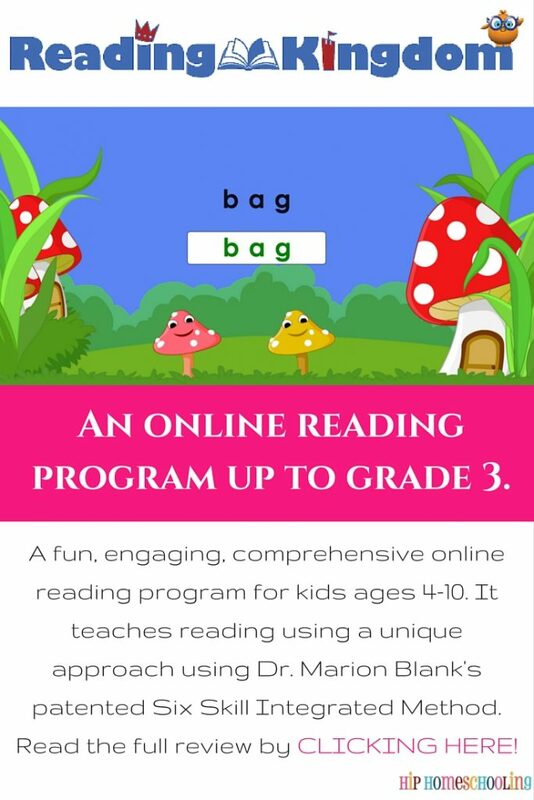 You can also purchase the stage 2 program for reading and writing lessons for grades 3, 4, and 5 and other supplemental programs/books/activities on their online store. The program offers an online subscription that is $19.99/month or $199.99/year. You can add an additional student for $9.99/month. If you aren’t sure if Reading Kingdom will be a good fit for your child, they offer a 30 day free trial! Head on over and try it out, risk free, by CLICKING HERE. What we thought of Reading Kingdom. Because my eldest son is so ahead in his reading, we used this program primarily with my 7 year old daughter. She is in grade 2 this year and was very excited to help me review a “reading game.” Overall we really liked this program. I think it is honestly revolutionary in the way that it teaches and I will be doing it with my younger son as well now that we are settled into our new home after our big move this month. This program is multi-faceted learning at its best. It would work well for an auditory learner, visual learner (LOTS of fun graphics and bright colors) and even my kinesthetic learner. It starts from the basics that may sometimes be missed and helps promote independent learning at the same time (who doesn’t love that?). Towards the end of our reviewing time, she was starting to get a little irritated with the wait time between screens. I am not sure if that is a result of our internet or simply the program loading the next portion of the program but she was slightly impatient with the regular “pauses”. Other than that, I was blown away by the results I saw and the value of this program, in my mind, is more than worth the price tag. I am so looking forward to doing it with my grade 1 son, also behind in his reading skills. I think it will help fill in the gaps that I have left and help me avoid some of the frustrations with repetitive reading that is, at this stage and age in the reading game, essential to long-term success. Make sure to check them out on their social media platforms below and send them a message if you have any questions about the program. I can tell you that if you stick with this program on a regular basis, you will see results. It’s that simple! It is a phenomenal product and a great addition to any home learning environment. To read more reviews, make sure to hop over to the Schoolhouse ReviewCrew HERE. There were a broad range of experiences and a lot of reviews on the Autism Spectrum Disorder (ASD) Reading program through Reading Kingdom as well.